Vic Sethi is a real character. A driven entrepreneur with a solid philosophy on life, writes Deputy Business Editor Tom Pegden. Family is paramount for him, as is a sense of community, and both play a central part in the way he helps run the family firm. 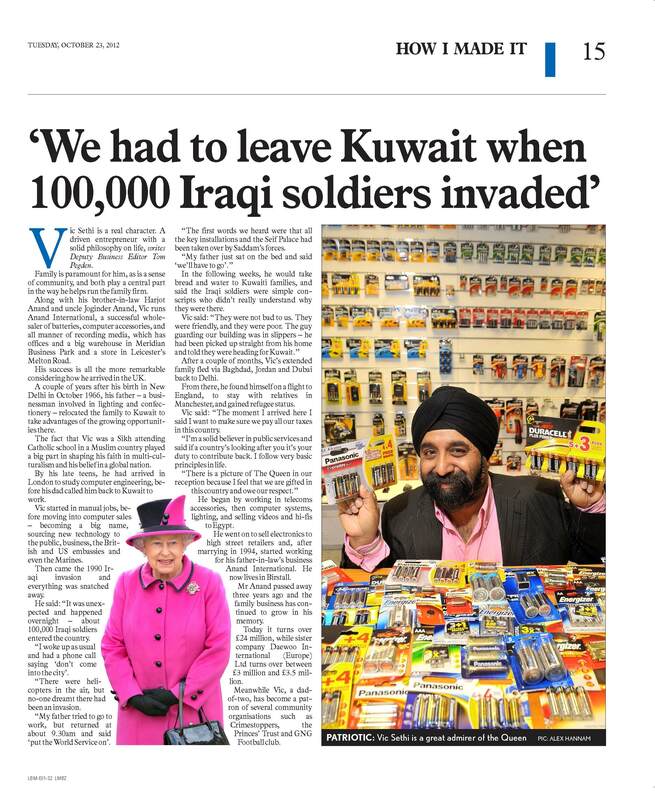 Along with his brother-in-law Harjot Anand and uncle Joginder Anand, Vic runs Anand International, a successful wholesaler of batteries, computer accessories, and all manner of recording media, which has offices and a big warehouse in Meridian Business Park and a store in Leicester’s Melton Road. His success is all the more remarkable considering how he arrived in the UK. A couple of years after his birth in New Delhi in October 1966, his father – a businessman involved in lighting and confectionery– relocated the family to Kuwait to take advantages of the growing opportunities there. The fact that Vic was a Sikh attending Catholic school in a Muslim country played a big part in shaping his faith in multi-culturalism and his belief in a global nation. By his late teens, he had arrived in London to study computer engineering, before his dad called him back to Kuwait to work. Vic started in manual jobs, before moving into computer sales – becoming a big name, sourcing new technology to the public, business, the British and US embassies and even the Marines. Then came the 1990 Iraqi invasion and everything was snatched away. In the following weeks, he would take bread and water to Kuwaiti families, and said the Iraqi soldiers were simple conscripts who didn’t really understand why they were there. Manchester, and gained refugee status. Vic said: “The moment I arrived here I said I want to make sure we pay all our taxes in this country. He began by working in telecoms accessories, then computer systems, lighting, and selling videos and hi-fi’s to Egypt. He went on to sell electronics tohigh street retailers and, after marrying in 1994, started working for his father-in-law’s business Anand International. He now lives in Birstall. Mr Anand passed away three years ago and the family business has continued to grow in his memory. Today it turns over £24 million, while sister company Daewoo International (Europe) Ltd turns over between £3 million and £3.5 million. Meanwhile Vic, a dad -f- two, has become a patron of several community organisations such as Crimestoppers, the Princes’ Trust and GNG Football club.